All Rockwool (stone wool) is made from rock and its insulation on buildings makes it naturally durable and stable over the lifetime of building and never needs replacing. The unique physical structure of Rockwool is it keeps its shape and toughness, and it is not affected by changes in temperature or humidity. 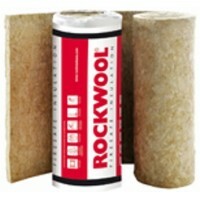 Rockwool products also deliver excellent thermal performance. It derives its excellent thermal properties from tiny pockets of air trapped within the physical structure of the stone wool, allowing it to keep the heat out in hot climate and the warmth inside in cold regions. This means you can create a pleasant and stable indoor temperature year after year, while saving energy and money for cooling/heating. Rockwool insulation can be used even under extreme conditions because it retains its insulation properties in both very low (e.g. oxygen installations) and very high (up to 1000°C) temperatures. Rockwool is inorganic and contains no nutritious substance. Therefore it will not be attacked by microorganisms. Stone wool will not rot and does not attract vermin. No CFCs, HFCs, HC FCs, or asbestos are used in the manufacture of Roxul stone wool products. Description RockTech B is a lightweight insulation blanket manufactured in a variety of thick.. Description ThermalRock S (Slab) is an insulation slab designed for general insulation purpos..
ROCKWOOL have proven invaluable in the insulation of utility steam generators over the year..
Rockwool insulation provide solutions for application at the ceiling line, ideal for residential ..